Achieving natural and softer look and have your wrinkles removed is finally possible. Dysport (abobotulinum toxin A) belongs to a family of botulinum toxin products approved by the FDA for cosmetic use in 2009. It is designed to soften the appearance of fine lines and wrinkles on the face without looking frozen. How is Dysport® different from Botox®? Dysport injections are safe and effective when administered by an expert like Dr. Avaliani. Adults 18 years and older are candidates for treatment. There is no right age to start treatment, but Dysport treatment is considered curative and preventative . When you start seeing faint lines on your face, you should consider this treatment to avoid those lines getting deeper and more prominent. What are absolute contraindications to receiving Dysport® treatment? If you have pre-existing neuromuscular disorders such as (Myasthenia gravis, Lambert-Eaton Syndrome, amyotrophic lateral sclerosis (ALS) should not be injected. If you also have pre existing swallowing or breathing problems, you should be advised against Dysport treatment. Patients with evidence of active infection or inflammation at the site of potential treatment area, should not be injected until inflammation or infection completely resolves. Dr. Avaliani will perform a detailed history intake and physical exam to determine if Dysport is the right treatment for you. How do I know if I need Dysport®? The best answer to this questions is: If you are bothered by the wrinkle lines on your face and want them removed, then you should schedule a consultation with Dr. Avaliani to determine if Dysport will work for you. The treatment with Dysport usually takes 5-15 minutes to complete, depending on the area being treated. Can I have bruising after Dysport® treatment? Dr. Avaliani pioneered a special technique and with the help of AccuVein, there is almost a 99% guarantee that there will be no more embarrassing bruising. At any time, during each injection point, there is a 50/50 change of hitting a small vessel that will develop into a bruise, with the help of Accuvein laser, Dr. Avaliani directly visualizes small and large blood vessels under skin and avoids injuring them, which means no more bruising and very happy patients. Is there any downtime after my treatment? There is absolutely no downtime and virtually all people return to their regular duties immediately. What are the most common adverse effects associated after Dysport® injections? After your treatment, you might experience and see very mild swelling, redness and tenderness where the product was injected. Rarely with Dr. Avaliani will you develop any bruising. 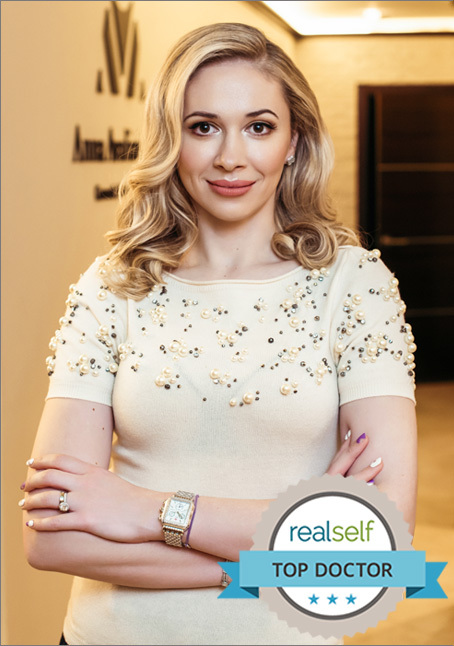 Dr. Avaliani is a proud provider of ASPIRE Gladerma Rewards for her client family. *Results and duration of effect may vary, no guaranty of specific results can be given. Degree of side effects may vary, for full disclosure please read consent for the procedure before your treatment.